The dynamic properties of moving water can create difficult scenarios when attempting to engineer a floating dock system. 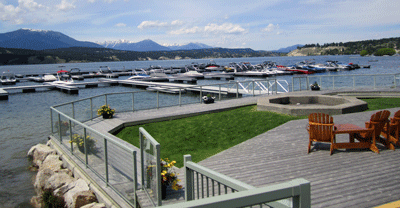 Varying live and dead loads can wreak havoc on an improperly designed dock. Unequal loading of the dock surface, a lack of buoyancy or simply adverse weather can cause the frame to twist and contort. In combination with our X9 frame, we systematically select and locate the dock floatation to prevent the above, even with variables outside the design criteria. All of our floats are securely attached using only high quality stainless steel through bolts or proprietary J bolts. Each fastener always includes ultra duty washers, external tooth lock washers and nylon insert lock nuts, so you never have to worry about your floats coming loose. 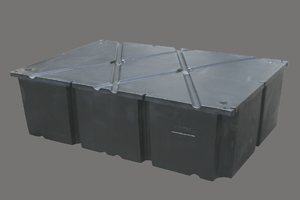 All Cellofoam dock floatation drums are made to exacting standards. All units are made from virgin Linear Low Density Polyethylene resin. This resin contains UV inhibitors and Carbon black to protect from deterioration caused by U.V. light. The resin offers a balance of toughness, rigidity, environmental stress crack resistance and low temperature impact performance. All floats are rotationally molded for a seamless one piece construction. The encasement is resistant to damage by animals and will not sink nor contaminate the water if punctured. All Cellofoam’s floats are filled with virgin expanded Polystyrene beads and then fused using steam. This increases the strength of the float as well as providing a back up flotation system in the unlikely event of catastrophic damage to the encasement. The flotation material used meets the higher UL94H and ASTM E84 requirement for flammability.